A delightful divestment day in London! 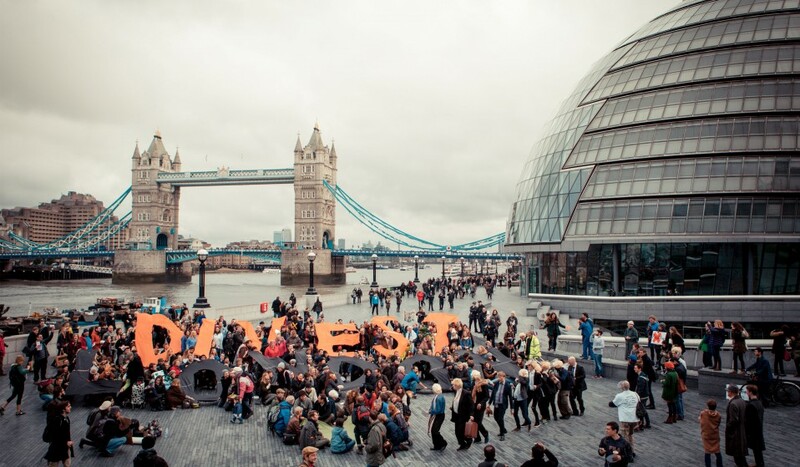 Yesterday’s Global Divestment Day activities in London were delightful! Hundreds of us gathered outside London’s City Hall to call on Mayor Boris Johnson and the Greater London Assembly to pull investments out of fossil fuel companies. After the shocking arrival of a whole group of Boris Johnson lookalikes, proceedings began with a sea shanty – appropriate because of the threat of rising sea levels caused by climate change. We then heard from Rebecca Newsom of Divest London, who told us about the progress they have made at SOAS (School of Oriental and African Studies at the University of London) in getting the institution to consider disinvesting from fossil fuels. Inspired by her words, we formed the words DIVEST LONDON (see above) followed by a green heart. It was powerful that the speeches began with talks about communities directly impacted by opencast coal mining by British-linked companies. Diana Salazar from London Mining Network member Colombia Solidarity Campaign spoke about the impacts of the Cerrejon Coal mine on communities in northern Colombia. This mine exports coal to the UK for burning in power stations here and is owned by three London-listed multinationals, Anglo American, BHP Billiton and Glencore. Smallscale farmers and indigenous communities have been forced off their land to make way for it. Rumana Hashem, one of LMN’s friends in Phulbari Solidarity Group, told us about the impacts of the proposed Phulbari coal mine in Bangladesh, which would displace tens of thousands of people and destroy their agricultural livelihoods – and that’s being proposed by another British company, GCM Resources. Ruth London from Fuel Poverty Action made the point that in working against climate change we also have to work in solidarity with directly affected communities like those that Diana and Rumana had spoken about; and we have to make sure that energy companies BOTH pull out of fossil fuels (and nuclear too) AND lower energy bills so that people are not dying of hypothermia or having to choose between heating and eating. Sunniva Taylor of Operation Noah, the Churches’ climate campaign organisation, told us about the action at the Church of England’s recent General Synod meeting, where campaigners dropped a huge banner calling on the C of E to pull investments out of fossil fuels; and about the role of faith and faith groups in motivating campaigns to protect the planet. Julia Christian told us more about the SOAS divestment campaign. Isobel Braithwait from Fossil Free Health spoke about divestment work among health care workers. Liam Crosby from Fossil Free Southwark explained the role of local authorities in fossil fuel investments and the importance of local campaigns to get them to disinvest. And finally Boris turned up again, just as it began to rain hard, and assured us that he was in love with fossil fuels, that we were all talking nonsense and that if he stays in power it will be raining oil – and he opened an oil-filled umbrella just to reinforce the point. Proceedings came to an end with singing and dancing in the rain. It was a beautiful event. It is rare to find so much joy and hope in the context of fighting such a massive evil. Injustice was named and our opponents were clear – but there was a marked absence of bitterness, aggression or despair. Activists from Fossil Free London and numerous other organisations including London Mining Network worked really well together in putting on this event. It felt very good to be working together in this way. The fossil fuel divestment movement has already caused consternation among fossil fuel companies. Let’s keep up the pressure now on all public authorities, academic and religious institutions to vote for a better future by pulling all their investments out of coal, oil and gas! Read more about the event at http://www.huffingtonpost.co.uk/2015/02/14/boris-johnson-masks-protestors_n_6684420.html?utm_hp_ref=tw.